You probably heard the advice that you should show enthusiasm in an interview if you want to get the job offer. Hiring managers are more likely to offer you the position if you seem enthusiastic about coming to work for them. So in this article, I’m going to give you six ways to show enthusiasm in interviews – even if you’re an introvert like me. If you’re a quiet, introverted person, you don’t have to pretend you’re outgoing and “bubbly”. But you SHOULD bring it up a notch… especially if the interviewer seems like a more outgoing person. You need to “meet them in the middle” and bring more energy than you usually would. Talk a little louder than usual. Use more inflection or changes in tone of voice (ups and downs). You don’t want to sound “flat” or monotone. If it’s a phone interview, remember that they can’t see your facial expressions or body language, so your tone of voice becomes even more important. So focus on showing even more energy in your tone of voice when answering questions in a phone interview. Overall, the way you talk and communicate is the first way hiring managers will judge your enthusiasm in the interview, so it’s really important to practice. You really want to seem like you’ve been looking forward to talking with them and are excited to be there in the interview. One of the best ways to show enthusiasm in the interview is to ask lots of questions. You want to seem like you’re eager to learn more and really putting a lot of thought into considering their position. For more ideas, here’s a list of 105 great questions to ask the interviewer. Overall, you should aim at ask at least two or three questions to each person you meet in the interview. 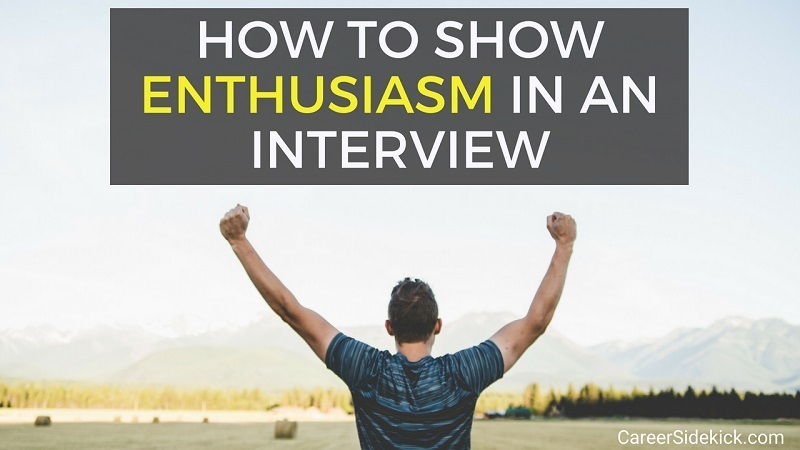 It’s a great way to show enthusiasm and if you don’t ask any questions, employers are a lot less likely to hire you. This advice is really simple but really important. If you want to seem enthusiastic in the interview, tell them verbally. You can also tell them you’re excited about the work the company or group is doing overall. In that example, you’re talking about the company’s overall mission and why that excites you. Every job seeker has different interests and priorities, so be honest and just tell them the pieces that actually do interest you. But don’t just assume they know you want the job. They want to HEAR from you that you want their job, and why. So make sure to tell them. No, I’m not talking about telling the hiring manager, “I really like your shirt”. Compliment them by telling them what their group or company is doing that stands out to you or is unique. What would make you want to come work for them? Compliment them on it. It could be their work culture, their products, their reputation, or anything else. …And it is. In this case, you’re just turning it into a compliment for the hiring manager. It’s THEIR team, so telling them that the team sounds awesome is a direct compliment to them. And everyone loves a compliment. You can also compliment them on something that their job seems to offer, that other positions don’t. This will make them feel like their job is unique (while also showing them you’re interested in the role). So try to give at least one compliment like this when you meet with a hiring manager. It’s a great way to show enthusiasm in the interview. Earlier in the article, we talked about showing enthusiasm in your voice and by maintaining good eye contact. Well, there’s another important piece to showing enthusiasm in your body language – your posture. Practice sitting upright and keeping good posture before your interview so you’re ready to impress when you sit down across from the interviewer. Avoid slouching or looking tired – both when listening and when answering interview questions. Avoid tapping or fiddling with your hands or feet, too. You want to see calm and interested in what you’re discussing. Don’t let your energy level or enthusiasm drop at the end. This final impression is what they’ll remember most. To end your interview, shake their hand firmly. Thank the interviewer for their time, and tell them you’re excited to hear about the next steps in the process. 2. It’ll make you seem more confident! You always want to seem like you’re confident at the end of the interview, and talking/acting with enthusiasm and energy is how you do it. As a bonus step, remember to send a Thank You note after the interview too! If you follow the tips above you will seem more enthusiastic in your interviews, and more confident when you tell them about yourself and your skills. The end result? You’ll make a better impression and get more job offers. Remember to practice these things before your next interview, though. Many of the tips above require steady practice to form habits… like your posture, eye contact, and your tone of voice and volume when speaking. So don’t wait until you need to “turn it on” at the last minute. Go practice in everyday conversations! That’s the best way to show enthusiasm in an interview and get the job offer.